Pinch me if I’m dreaming! It was, after all, a November night that was very much like a dream, as Houston’s Gexa Energy Broadway series presented “RAIN: A Tribute to the Beatles.” The audience atmosphere was electrically charged even before the curtain went up on the pop culture musical revue that just this summer had completed 300 performances on Broadway before setting out on the world tour with this original Broadway cast and its very successful homage to “The Fab Four.” Many of us in the audience attended in the hope of recapturing some of the youthful energy we spent a half-century before while making The Beatles a worldwide musical phenomenon. We would not be disappointed. The staging was cleverly non-complex. 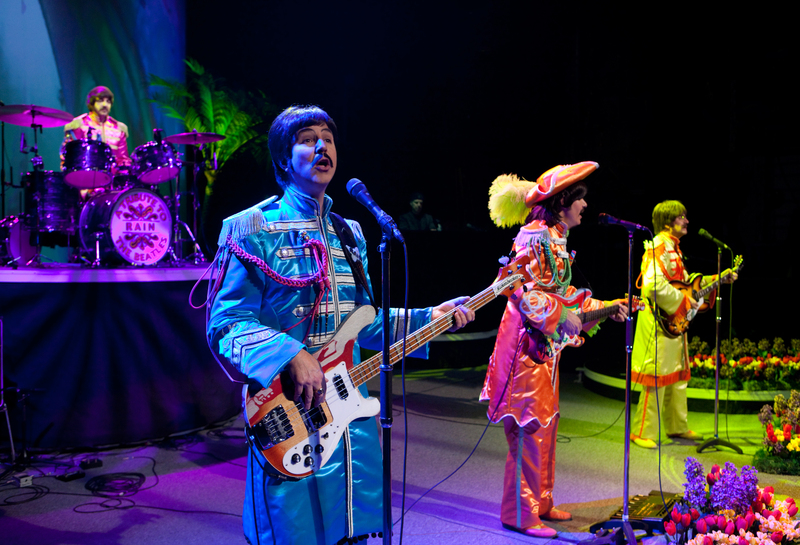 Our four stars (Joey Curatolo as Paul McCartney, Steve Landes as John Lennon, Joe Bithorn as George Harrison & Ralph Castelli as Ringo Starr) were positioned for the most part at center-stage with just a sprinkling of colorful flowers and small palm tree plants. 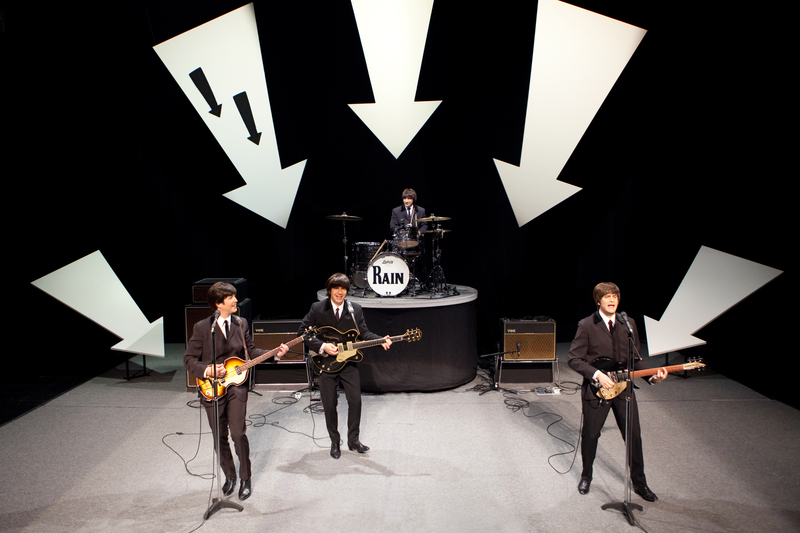 What made things much more interesting were the skillful use of dazzling psychedelic lighting, and surrounding projections (both backstage and on either side of the proscenium) of carefully selected clips from The Beatles’ fascinating rise to fame. Those clips were presented in such a way as to give the audience the sensation of being present for such pivotal Beatles events as the original Ed Sullivan Show appearance in February of 1964, and the monumental Shea Stadium concert of August 15, 1965. But more central to the show’s success is the authenticity of the musical performances that began with the infectious joy of “I Want to Hold Your Hand,” and “All My Lovin,” and moved quickly on to the lush and rich harmonies of, “That Boy.” There were the pulsating thrills of, “I Saw Her Standing There,” and the rhythmic explosion of “A Hard Days Night,” with a fine vocal from Curatolo. Amusing animated projections of frenzied fans in hot pursuit added to the fun as Mr. Bithorn delivered another excellent vocal with “I’m Happy Just to Dance With You.” A silken rendition of the classic “Yesterday,” featured brilliant work on acoustic guitar and prompted an audience sing-a-long. The Shea Stadium segment began with the projected frenzy of the original crowd as the group delivered a super-charged “I Feel Fine,” that had the excited audience feeling the same way. As the lads beamed, the joy continued with a thrilling, “Day Tripper,” and a “Twist and Shout,” that had the audience on its feet and dancing in the aisles. As the guys took a brief break, there were amusing projections of now-corny television ads of the era featuring the hilarity of Fred and Barney Flintstone promoting Winston cigarettes, as housewives discovered the joys of free nylons in boxes of Duz Detergent while piling suds high on their heads shampooing with Prell. Suddenly the gents were back in Peter Max style with the dazzling colors and gleaming satins of the military uniforms in “Sgt. Pepper’s Lonely Hearts Club Band,” and a nice rendering of, “With a Little Help From My Friends.” Spooky floating images accompanied the mystery of, “Eleanor Rigby,” and misty rainbow colored lighting accented an otherworldly, “Strawberry Fields.” Then the first part of the program closed with hand clapping fun for the fully three generations that spanned the many audience age groups. Everyone seemed to join in for “When I’m 64,” as more cheerful Peter Max images flashed by. The next flashing projections brought the audience into the more counter-cultural period of the Vietnam War with images of LBJ, Nixon, Woodstock hippies, and bombs dropping, while the musical quartet encouraged peace with Landes dressed in an eye-popping yellow suit as he led their stunning performance of “Come Together.” There were the lashing rhythms of, “Get Back,” and a plea to “change the world,” in “Revolution,” that seemed oddly current as protestors are on the march around the world. Of course there was a thrilling, “Give Peace a Chance,” and a tender, “Let It Be,” that seemed to wrap its arms around the appreciative audience. The requisite encore brought the escalating power of “Hey Jude,” and seemed to cement the audience members as one while they cheerfully joined in for the countless choruses. Was it all more fun than having attended one of the original Beatles concerts? It just might have been! The GEXA ENERGY BROADWAY at the Hobby Center 2012 Series continues with The Addams Family (1/10-1/15), Million Dollar Quartet (2/28-3/4), Come Fly Away (4/10-4/15), Wishful Drinking (5.15-5/20), and The Lion King (7/10-8/12). For tickets and information call (800) 982-ARTS (2787), or online at www.broadwayacrossamerica.com. 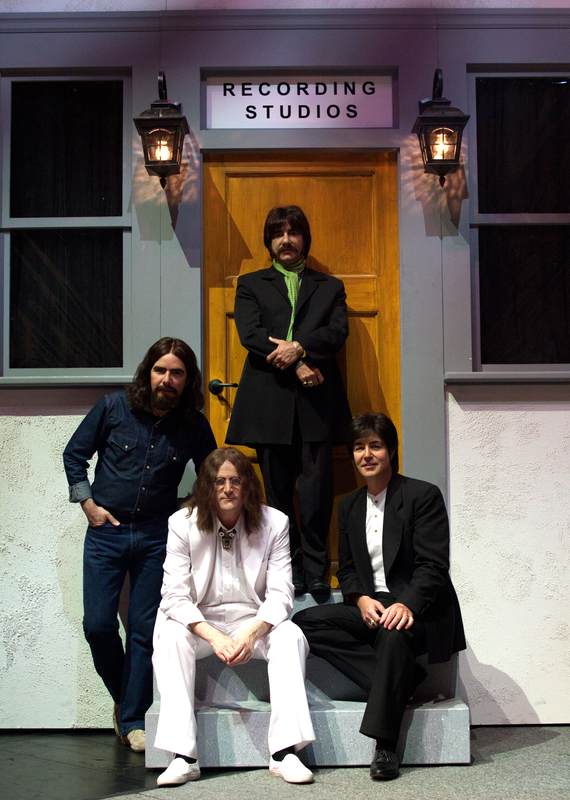 This entry was posted in Broadway, Concert Reviews, Miscellaneous Reviews, Theater Reviews and tagged Beatles, Broadway, Celebrities, concerts, Entertainment, Houston, music, musicals, plays, RAIN A Tribute to The Beatles, Reviews, Texas, theatre. Bookmark the permalink.